975) There is a so-called Double-Nosed Andean Tiger Hound “breed” of dog (not officially recognized as a breed) that, as the name suggests, has a split nose. 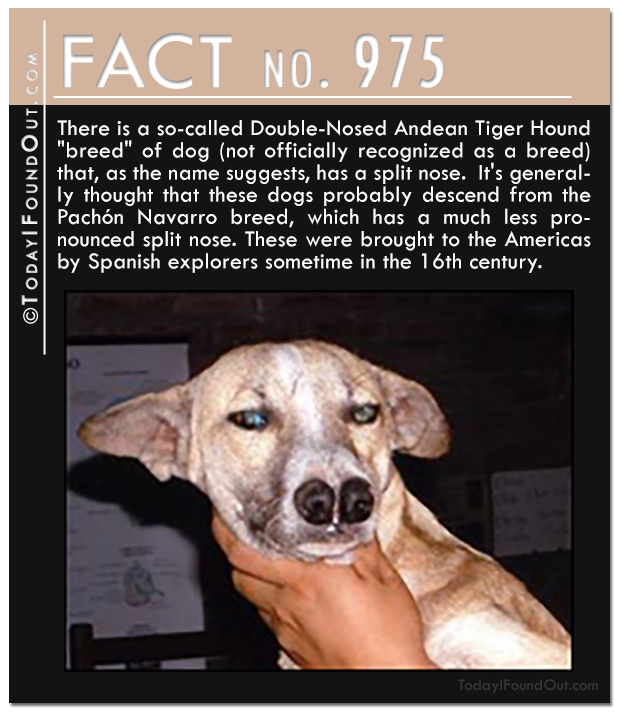 It’s generally thought that these dogs probably descend from the Pachón Navarro breed, which has a much less pronounced split nose. These were brought to the Americas by Spanish explorers sometime in the 16th century. 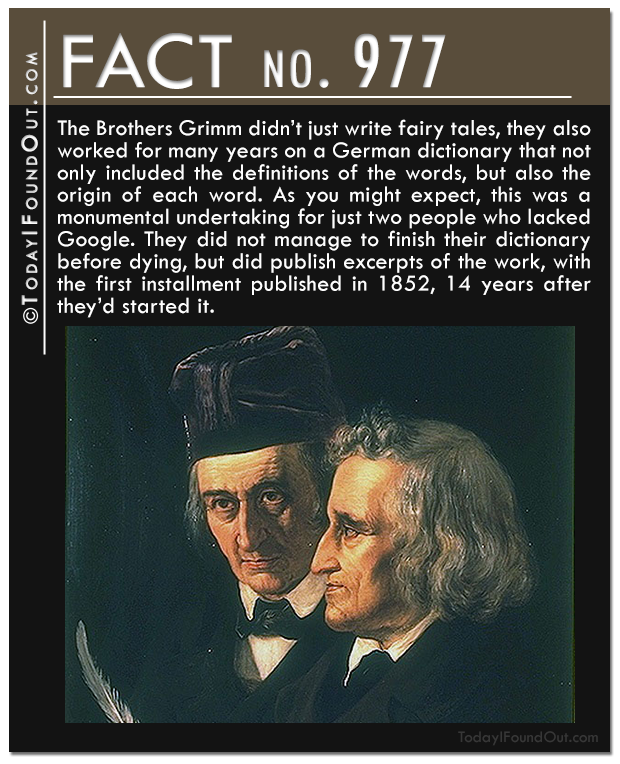 977) The Brothers Grimm didn’t just write fairy tales, they also worked for many years on a German dictionary that not only included the definitions of the words, but also the origin of each word. As you might expect, this was a monumental undertaking for just two people who lacked Google. They did not manage to finish their dictionary before dying, but did publish excerpts of the work, with the first installment published in 1852, 14 years after they’d started it. 979) In 1948, Huang Yijun of China became pregnant, but later found out that she had an ectopic pregnancy, meaning the egg had not attached in the uterus, resulting in an exceptionally rare abdominal pregnancy. While babies that attach in such a way (often to things like the woman’s liver, bowels, diaphragm, etc.) 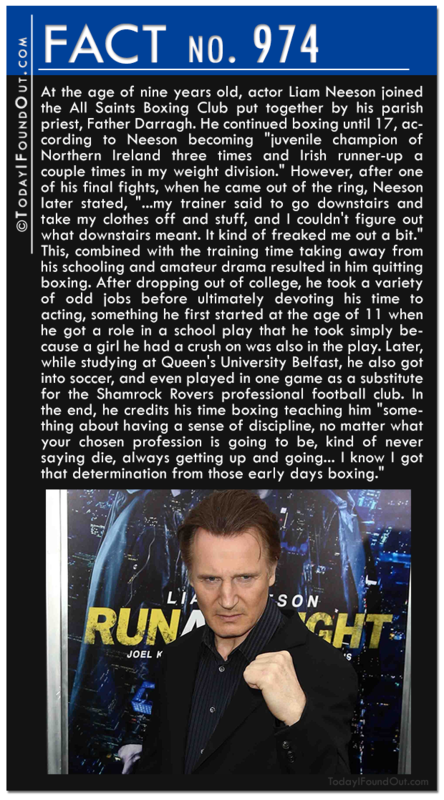 occasionally survive, Haung’s did not. 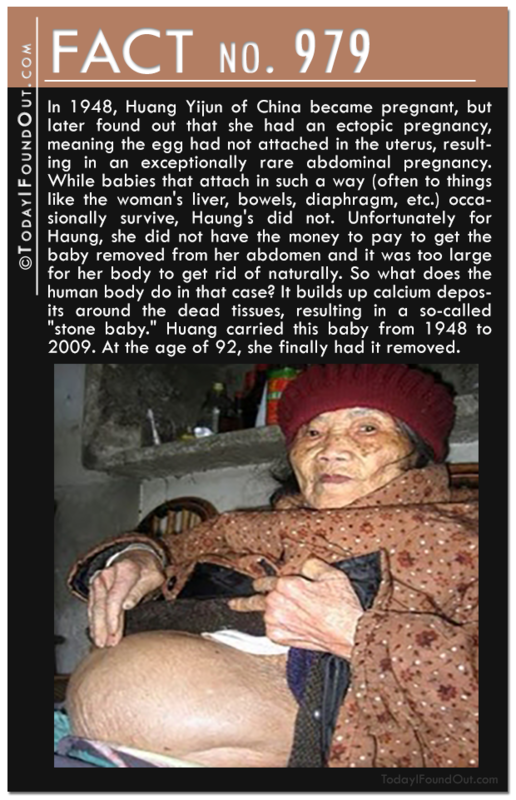 Unfortunately for Haung, she did not have the money to pay to get the baby removed from her abdomen and it was too large for her body to get rid of naturally. So what does the human body do in that case? It builds up calcium deposits around the dead tissues, resulting in a so-called “stone baby.” Huang carried this baby from 1948 to 2009. At the age of 92, she finally had it removed. 980) The slinky was invented by accident when its creator, marine engineer Richard James, was working at a shipyard designing a device to measure horsepower output on naval battleships. 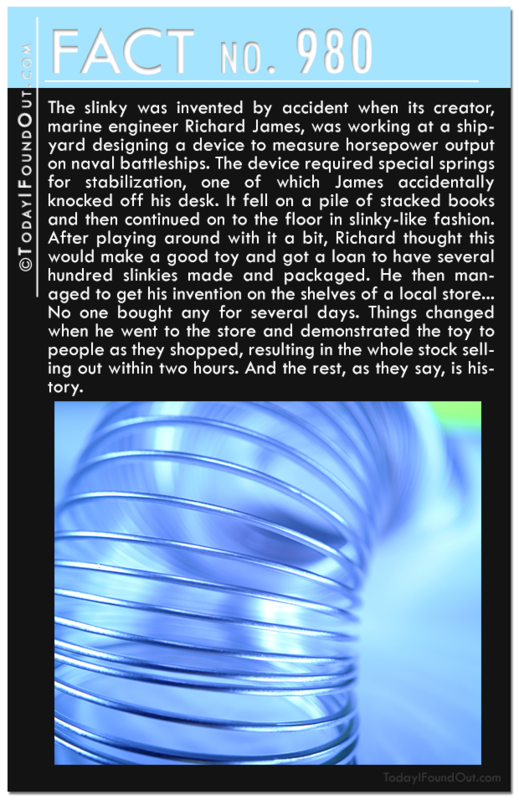 The device required special springs for stabilization, one of which James accidentally knocked off his desk. It fell on a pile of stacked books and then continued on to the floor in slinky-like fashion. After playing around with it a bit, Richard thought this would make a good toy and got a loan to have several hundred slinkies made and packaged. 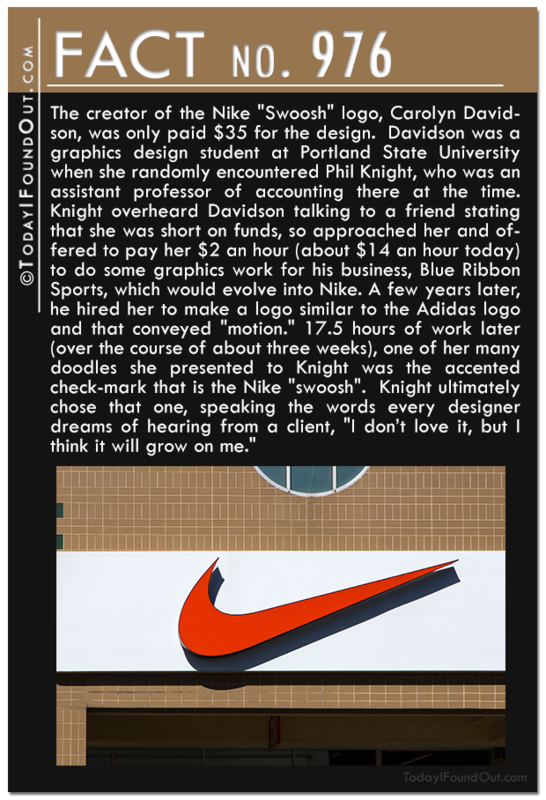 He then managed to get his invention on the shelves of a local store… No one bought any for several days. Things changed when he went to the store and demonstrated the toy to people as they shopped, resulting in the whole stock selling out within two hours. And the rest, as they say, is history. 981) Ever wonder why Michael Jackson’s skin turned white as he aged? 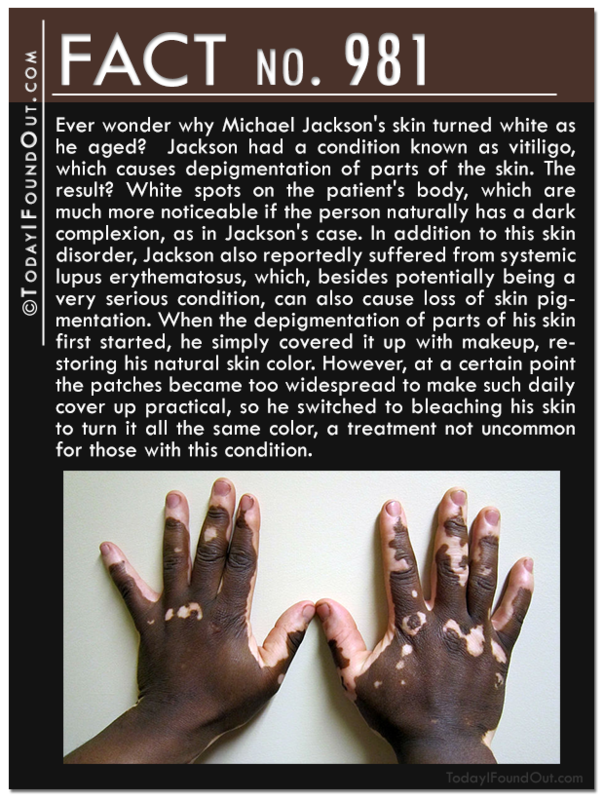 Jackson had a condition known as vitiligo, which causes depigmentation of parts of the skin. The result? White spots on the patient’s body, which are much more noticeable if the person naturally has a dark complexion, as in Jackson’s case. In addition to this skin disorder, Jackson also reportedly suffered from systemic lupus erythematosus, which, besides potentially being a very serious condition, can also cause loss of skin pigmentation. When the depigmentation of parts of his skin first started, he simply covered it up with makeup, restoring his natural skin color. However, at a certain point the patches became too widespread to make such daily cover up practical, so he switched to bleaching his skin to turn it all the same color, a treatment not uncommon for those with this condition. 982) If you’re wondering why rabbits are considered prolific breeders, it has less to do with them getting it on more than many other animals, necessarily, and more to do with the time frames involved in the process of producing new rabbits. A baby rabbit becomes sexually mature in an average of just about 5-6 months, and sometimes even sooner. They can potentially live up to around 10 years. Further, it takes only around a month from the point of getting pregnant for a female rabbit to give birth. Their litters can include as many as a dozen rabbits! What makes this even more astounding is that the female rabbit can get pregnant as soon as the next day after giving birth. Rabbits are induced ovulators, so the females are pretty much ready to get pregnant anytime they mate (assuming they aren’t already pregnant), with the mating itself triggering the ovulation. So even just a single female can give birth to several dozen baby rabbits per year. 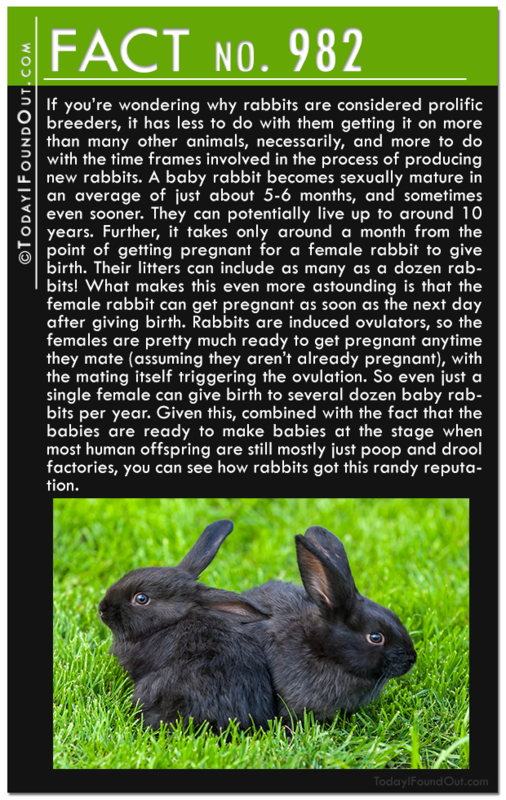 Given this, combined with the fact that the babies are ready to make babies at the stage when most human offspring are still mostly just poop and drool factories, you can see how rabbits got this randy reputation.